The Yinhe company owns the boring machine to produce the steel tubes which can be 12 meters, and its ID is 180 to 630 mm, OD is 220 to 820 mm, the wall thickness can reach 15 to 150 mm, this equipment and the company`s good technology will have fine process on the deep holes in the tube`s inner side, because the big diameter hydraulic cylinder can be cold drew. The boring hydraulic cylinder is formed by the inner bore process of blank hot roller pipes. 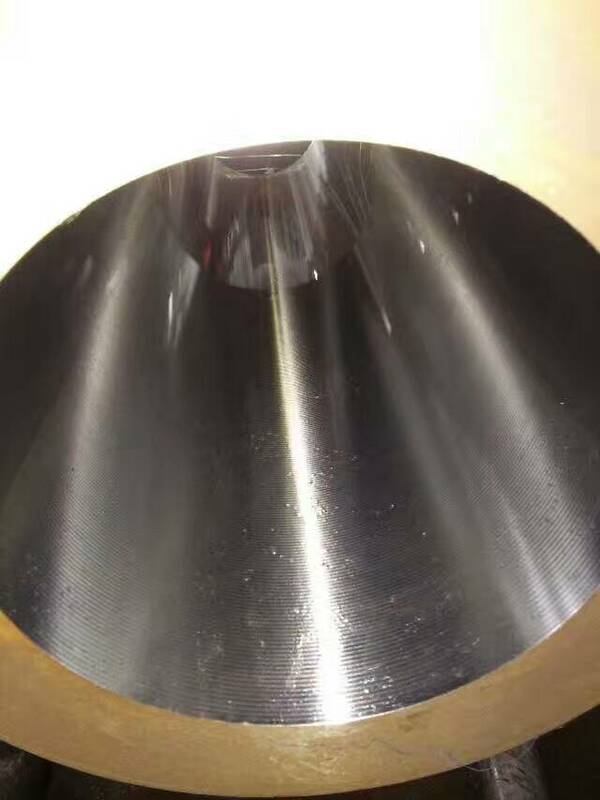 The main performance parameter is: cylinder material, tensile property, yield strength, elongation, inner or outer surface hardness, ID tolerance, inner hole, inner hole roughness and straightness, the material usually is 20 #, 45 #, 16 mn, ST52, etc. The whole steel tube will be heat treated, outer surface will be acid watering and phosphorized and then paint oil. As for how to choose the cutting tools, the company has several tools on the large boring lathe, they are deep hole boring tool, half-fine boring tool, fine boring tool and the roller head tool. The roller head tool will be services in the last procedure to make complete product surface which can reach planned ID tolerance as well, the inner hole surface is smooth, hard and wear-resistant. The technology of the inner hole: flat head, chamfering, rough boring, half-boring, boring, honing or rolling, the inner hole straightness of this process can reach to 0.2 mm/m or less, this technology can eliminate the difference of the wall thickness by hot rolled tubes, thus is an important equipment to produce the large diameter hydraulic cylinder. Looking for ideal Boring Hydraulic Cylinder Manufacturer & supplier ? We have a wide selection at great prices to help you get creative. All the Blank Hot Roller Pipes Cylinder are quality guaranteed. We are China Origin Factory of Large Diameter Hydraulic Cylinder. If you have any question, please feel free to contact us.